Facts about Fiji Banded Iguana. "Scientific name for Fiji Banded Iguana is Brachylophus fasciatus". Fiji Banded Iguana is an arboreal species of lizard found in south eastern Fijian islands. The Fiji Banded Iguana, mostly found in Tonga, is one of the most geographically isolated members of the family iguanidae and is believed to have been introduced by humans in the island. The Fiji Banded Iguana populations have been steadily declining over the past century due to introduction of house cats and mongoose to the Fijian islands as well as habitat destruction due to fire, storm and agricultural development. The government of Fiji considers the banded iguana a national treasure and they have been featured in currency, phone book covers and postage stamps. Fiji banded iguana can reach a length of up to 60 cm (24 in) and weigh up to 200 grams (0.44 lbs). Their crests are short reaching a length of 0.5 cm (0.24 in). The males have 2 or 3 pale-blue or white 2 cm (3/4 inches) wide bands crossing their emerald green background, and a pattern of spots and stripes on their neck. The female Fiji Banded Iguana are solid green with occasional spots or partial bands. Both males and females have a yellow underside. The Fiji Banded Iguana is diurnal, spending its days basking and foraging, then retreating to the treetops when the night comes. Their skin is sensitive to light and they can change their skin color to match their background. The male Fiji Banded Iguana are highly visual and aggressive. When threatened by intruders, the iguanas deepen their green coloration and intensify their bands, then lunge at the intruder with open mouth. The Fiji Banded Iguana is herbivorous, feeding on leaves, fruits, and flowers. They particularly feed on fruits such as papaya and banana, and flowers such as the hibiscus flower of the Vau tree. 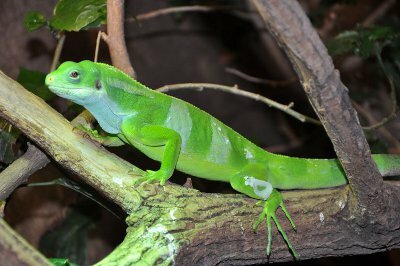 Captive hatch-lings of the Fiji banded iguana have been observed to be eating insects, though the adult iguanas do not. Courtship of the Fiji banded iguanas is similar to other iguanids. The male approaches the female and tongue-flicks the female’s back, neck regions and limbs. The breeding season usually occurs in November. The Fiji Banded Iguana are oviparous and have a long incubation period of between 160 and 170 days. The female Fiji Banded Iguana guard the nest of 3 to 6 eggs; unusual of other iguanids. The eggs hatch in the rainy season and the hatchlings obtain moisture by licking the wet leaves. Brachylophus fasciatus species was first described in 1800 by French zoologist Alexandre Brongniart. Brachylophus, the generic name, is derived from two Greek words: brachys meaning "short" and lophos meaning "plume" or "crest", which denotes the spiny crests along its back. While fasciatus, the specific name, is a Latin word meaning "banded". The Fiji islands where the banded iguanas are found include Wakaya, Bega, Moturiki, Vatulele, Dravuni, Ono, Taveuni, Vanua, Nggamea, Balavu, Vatu Vara, Avea, Lakeba, Aiwa, Toyota, Oneata, Fulaga, and Kabara. Apart from house cats, mongoose and habitat destruction, another factor contributing to the decline of population of Fiji banded Iguanas is that some communities in the islands hunt it for food. The current wild population of the Fiji Banded Iguana is less than 10,000 in 29 distinct subpopulations. They are mostly found in the undisturbed habitats on the Fiji islands such as high cloud forests and low-lying coastal swamps.